For the 5th year in a row, Los Angeles Food & Wine hosted another successful weekend of food and wine events. 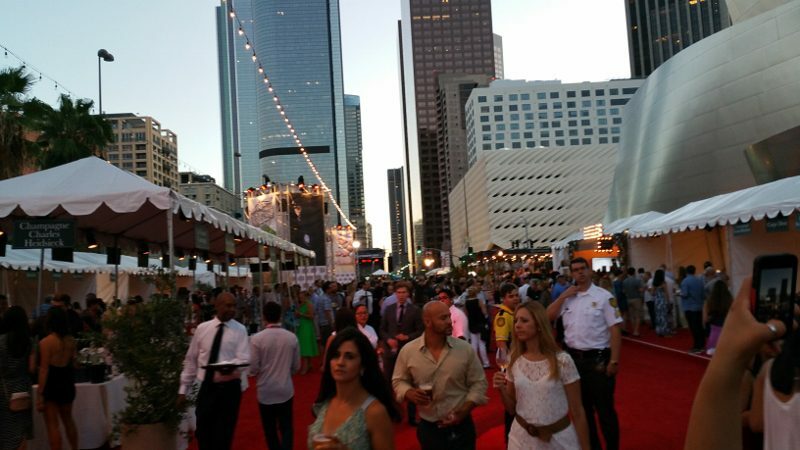 For three nights, Grand Avenue in Downtown LA was closed off to traffic and filled with more than 30 restaurants each night and more than 100 wines. With Disney Hall looming above, hundreds of attendees wandered up and down the street trying the various foods and wines over a three hour period. From San Francisco to New York, Elizabeth Falkner is a nationally recognized chef and James Beard Foundation Award nominee. She has competed on numerous television shows, including Bravo TV’s Top Chef Masters and Food Network’s Iron Chef Series. Falkner was best known as the Executive Chef/Pastry Chef at Citizen Cake in San Francisco before moving to New York where she opened two restaurants, including a pizzeria. With a multicultural upbringing and training in classic French cuisine, Anita Lo has been named one of ten “Best New Chefs in America” by Food & Wine Magazine (2001) and placed 4th in Bravo TV’s Top Chef Masters. Her restaurant Annisa, which has been open since 2000, means “women” in Arabic. And, she is the author of Cooking Without Borders, which highlights her recipes with multicultural flavors. From artist to world traveler to award winning chef, Jenn Louis has achieved national prominence as one of Food & Wine’s “Best New Chefs” and a competitor on Bravo TV “Top Chef Masters.” Louis owns one of the leading full-service catering companies in Portland, Culinary Artistry, as well as two restaurants – Lincoln, one of Conde Nast Traveler’s Top Restaurants in North America, and Sunshine Tavern. Her newest book, Pasta By Hand, includes 65 recipes for hand-shaped traditional pastas and dumplings. Stephanie Izard was the first woman to win Bravo TV’s Top Chef (Season 4.2008), as well as the winner of the title of “Fan Favorite.” She opened her first of two restaurants, Girl & The Goat, in Chicago in 2010 which was nominated as Best New Restaurant by the James Beard Foundation. She has been named one of Food & Wine Magazine’s “Best New Chefs” and received the award for James Beard Foundation Best Chef Great Lakes. Raised in Maryland, Liza Shaw attended the California Culinary Academy before working at Acquerello and then A16 in San Francisco. Influenced by Southern Italian culinary traditions, Shaw opened Merigan Sub Shop, offering East Coast Italian hoagies and an in-house butchery. Her cooking is known for its rusticity and soulfulness and her sandwich shop is recognized for some of the best sandwiches in the city. With such pedigrees, these five women represent the immense talent that is in the kitchen and set the stage for more female chefs to come.